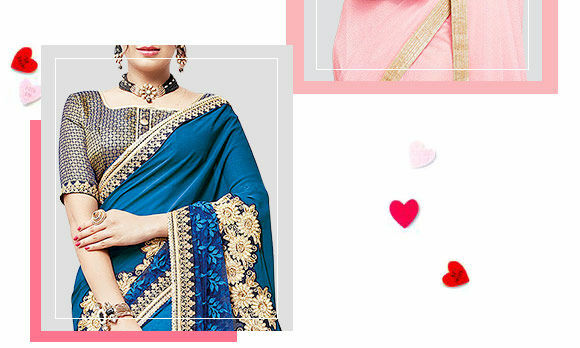 Here are the Hottest Spring Summer Trends from India. Steamy. Flirty. Feminine. Flamboyant. What are you dressing up to be, this Valentine's Day? 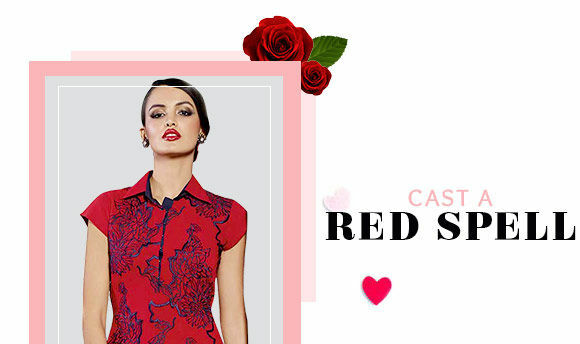 We've got a bunch of sartorial ideas and the hottest romantic trends lined up for you. Deadly Black and Killer Red. Icy Neutrals and flaming Florals. Floor kissing silhouettes and dramatic Designer-inspirations. Own them all, coz you can't say no to any. Celebrate love. When you've got it, flaunt it. Set his senses on fire in a rich, velvety Black Saree in Georgette, Chiffon, Lycra or Crepe. A shimmering sequined border, a sprinkle of stone work motifs, and voila! You can conjure black magic. Subtle Beige, cool Grey and wispy White are the new mind-numbers. Try our floor-kissing Abaya Suits in sheer Net fabric and Slits in uber chic neutral shades to look incredibly sensual. When you have to wear the best, make it Designer Wear. 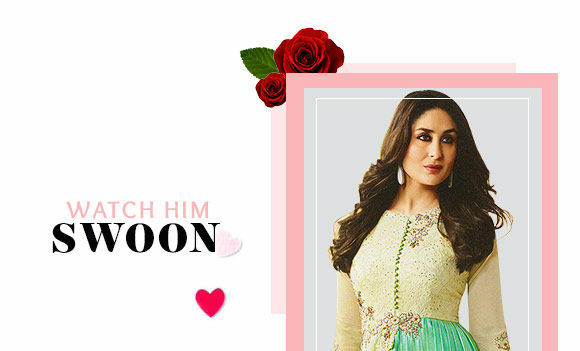 Flaunt layered Abaya Suits in Pastel hues, Jacket style Blouses with clinging drapes and Kurtas with unusual hemlines. Conquer him with your floral charm. 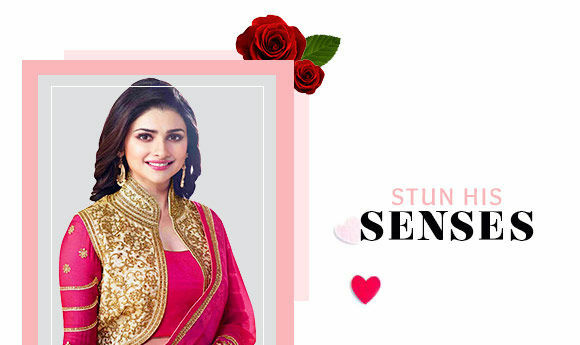 Go in for rich, extravagant silhouettes with lavish embroidered Floral motifs on pallus, borders, necklines and sleeves. Colorful, vivacious and pretty is the way to be. Form-hugging Georgette gets super flattering in every Red shade. Your best Valentine buy, definitely. 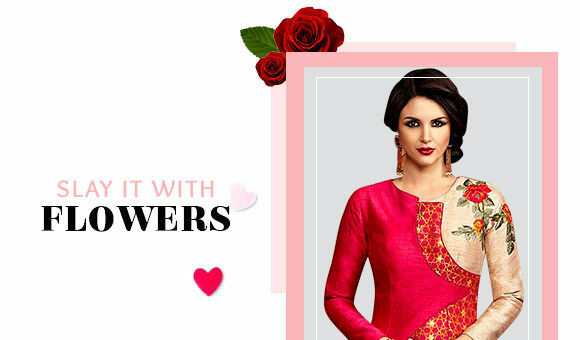 Get draped in Printed and Embroidered Sarees in Red Georgette for looks that kill. Wear a stunning piece of Applique work for that pretty, flirty touch. 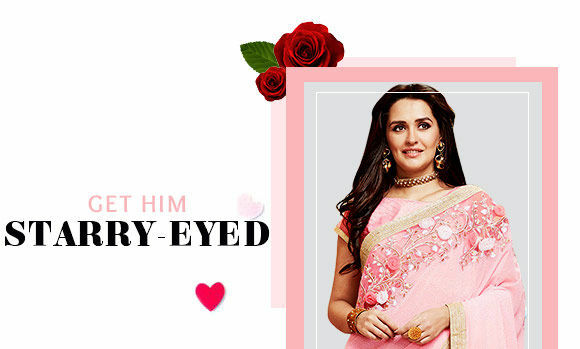 Straight Suits or Anarkalis, Chiffon Sarees or Dresses with lace and floral patches are easily Cupid's favorite attires.